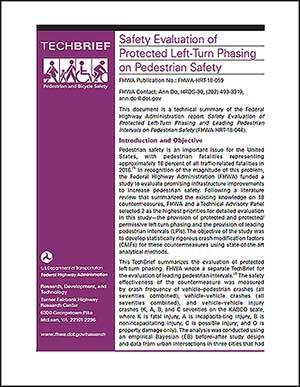 This TechBrief summarizes the evaluation of protected left-turn phasing. FHWA wrote a separate TechBrief for the evaluation of leading pedestrian intervals. (2) The safety effectiveness of the countermeasure was measured by crash frequency of vehicle–pedestrian crashes (all severities combined), vehicle–vehicle crashes (all severities combined), and vehicle–vehicle injury crashes (K, A, B, and C severities on the KABCO scale, where K is fatal injury, A is incapacitating injury, B is nonincapacitating injury, C is possible injury, and O is property damage only). The analysis was conducted using an empirical Bayesian (EB) before–after study design and data from urban intersections in three cities that had installed the countermeasure of interest (Chicago, IL; New York City (NYC), NY; and Toronto, ON).